Artifacts Produced From One 14 Pound Nodule. 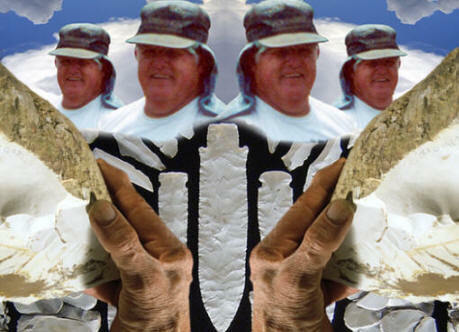 This picture shows Larry Kinsella and a few of the more than 200 points and tools he made from a fourteen pound (6.350 kilograms) Burlington chert nodule for the Missouri Archaeology Month poster. 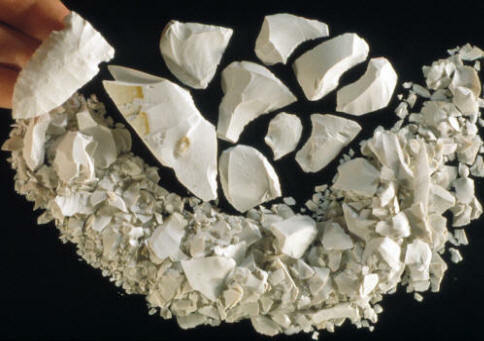 This article illustrates and describes a flintknapping experiment that was proposed by archaeologist Tim Baumann, PhD. for the 2008 Missouri Archaeology Month poster. The theme of the poster is "Ozarks Lithic Resources." The goal was to see how many tools could be produced from a medium sized chert nodule. Flintknapper and experimental archaeologist Larry Kinsella carried out this unique project with his usual proficiency and curious nature. A fourteen pound Burlington chert nodule produced 16 points and 217 tools in a total working time of 14 hours and 37 minutes. "Missouri Archaeology Month is an annual statewide celebration in September to promote the protection and documentation of Missouri's archaeological resources. 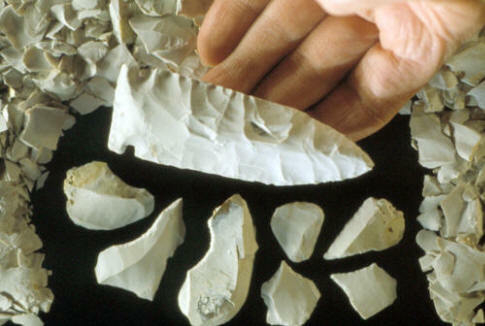 The theme for 2008 is "Ozarks lithic Resources," which were used by prehistoric Native Americans to make stone tools." ---2008, Missouri Archaeological Society, poster. "Archaeologists sometimes conduct controlled experiments in which they manufacture their own stone tools." ---1998, David Hurst Thomas, "Archaeology, Third Edition," p. 71. "Experimental Archaeology refers to the application of experimental methods in the data collection and description, interpretation, and explanation of the archaeological record." ---1996, Brian M. Fagan, "The Oxford Companion To Archaeology," p. 234. "The best represented (experimental studies) are replication experiments on which artifacts or activities are reproduced. These are well exemplified by stone-tools replication---"1996, Brian M. Fagan, "The Oxford Companion To Archaeology," p. 234. 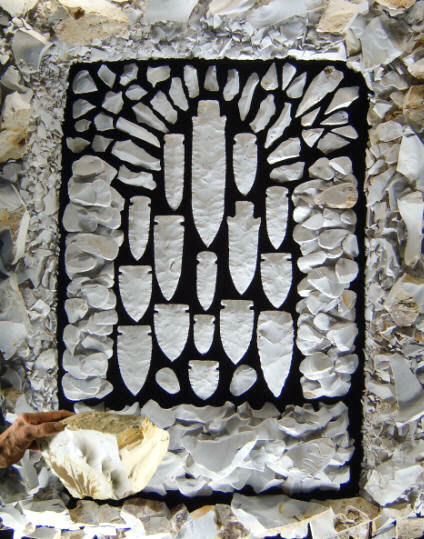 All the points and tools made for this flintknapping project were produced by Larry Kinsella at the request of archaeologist Tim Baumann. 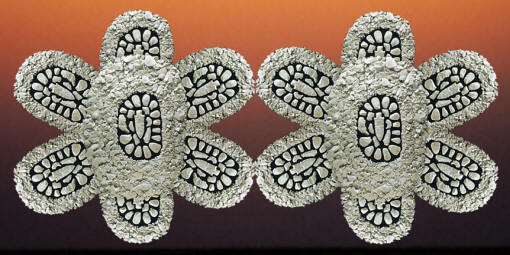 For the purpose of illustrating them in the 2008 Missouri Archaeology Month's "Ozarks Lithic resources" themed poster. The back of the poster illustrates many different types of Missouri cherts. More information about the Missouri Archaeology Society and this poster can be found at www.moarchaeologymonth.info/ or by phone at 417 836 3773. This picture shows all 16 points, 217 tools and most of the flaking debris that were produced from the 14 pound (6.350 kilograms) nodule. The inset hand is holding the original nodule from which the artifacts were made. Most of the flakes around the outside edge are rough outer cortex flakes unsuitable for tool making. 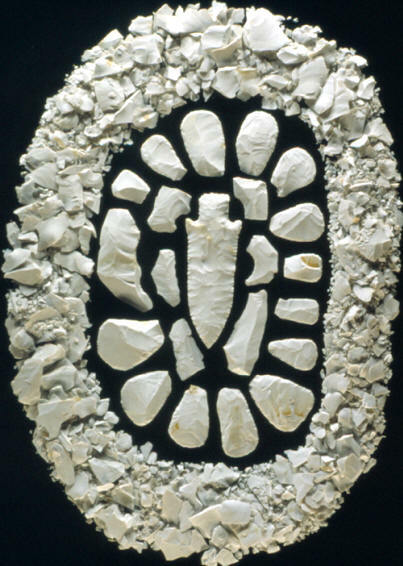 The 16 points represented in the center are Etley, Godar, Matanzas and 1 un-notched biface or cache blade. The lower pile of flakes, underneath the nodule and to the right, are spoke shaves. The two piles of tools on the right and left side of the points are end-scrapers. The long narrow flakes circling the top of the points are flake knives. The 10 pointed tools at top right are reamers and the 11 tools with small points at upper left are gravers. The debris flakes are piled around all four sides. The total production time to make everything in this picture is 14 hours and 37 minutes. The goal of the project was to illustrate the number of stone tools that could be produced from one medium sized chert nodule. 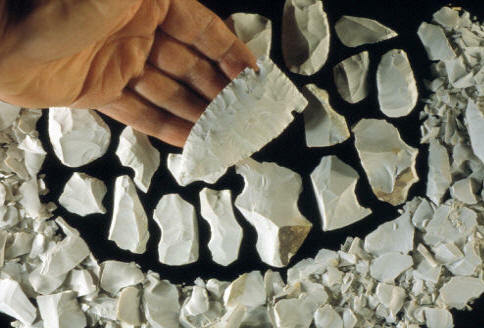 The production began from a single piece of Burlington chert that weighed 14 pounds (6.350 kilograms). It took Larry Kinsella six minutes to reduce the nodule into many different sizes of flakes or spalls with the use of a quartzite hammerstone. These tools were produced from a single large flake. Larry Kinsella was able to make one Etley point measuring 4 1/4 inches (10.7 cm) long and several end-scrapers, spoke shaves and 3 flake knives. It took 51 minutes to make the Etley and 26 minutes to make the 21 unifacial tools. The Etley point was made with a whitetail deer antler billet, copper pressure flaker, sandstone abrader, and a copper notcher. The points and tools produced from the 14 pound (6.350 kilograms) nodule include only Late Archaic types similar to those found on sites in Missouri and Illinois. 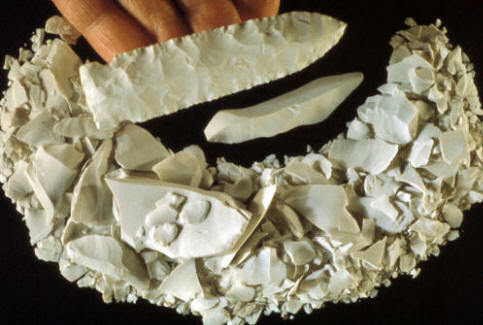 The point types include Etley, Godar, Matanzas, and a Cache blade or biface. The tools include end-scrapers, spoke shaves, gravers, reamers, flake knives and burins. A total of 16 points and 217 tools were produced from the original nodule. This Godar point and 19 unifacial tools were produced from one flake that was detached from the 14 pound nodule (6.350 kilograms). All the flakes laying along the edges are waste flakes. The Godar point measures 3 1/4 inches (8 cm) long and took 40 minutes to make. Larry used a whitetail deer antler billet, a copper pressure flaker, sandstone abrader, and a copper notcher to make this Godar point. The 19 tools include 7 end scrapers, 8 spoke shaves, 1 graver, 1 flake knife and 2 reamers. The 19 tools took 19 minutes to make. Six different tools were used to complete the project. They include a quartzite hammerstone, a whitetail deer antler billet, a copper pressure flaker that is inserted into a whitetail deer antler handle, a copper notching tool--fashioned similarly to Ishi's, a sandstone abrader and a split cowhide suede leather leg pad. It took 37 minutes to make the Matanzas point and flake knife pictured above. The Matanzas point measures 3 1/2 inches (8.9 cm) long. Approximately fifteen large flakes or spalls were detached from the nodule. Each flake produced one or two points and from 1 to 55 tools. The production time of each point and for each group of tools was recorded. The total amount of time to produce all 16 points and 217 tools is 14 hours and 37 minutes. This Godar point and 7 unifacial tools were made from one flake. The Godar point measures 3 13/16 inches (9.7 cm) long and took 51 minutes to make. The unifacial tools are represented by 1 end-scraper, 2 gravers, 3 spoke shaves and 1 reamer. It took 11 minutes to make these tools. The largest flake that was detached from the 14 pound (6.350 kilograms) nodule produced an Etley point measuring 6 11/16 inches (16.9 cm) long and a Matanzas point measuring 2 7/8 inches (7.3 cm) long. The flaking debris produced 26 spoke shaves, 25 end-scrapers, 2 flake knives and 2 reamers. The Etley took 1 hour and 3 minutes to make. The Matanzas took 37 minutes to make and the 55 tools took 1 hour and 29 minutes. This Matanzas point and 9 unifacial tools were produced from one flake or spall that was detached from the 14 pound (6.350 kilograms) nodule. This Matanzas point measures 1 1/2 inches (3.8 cm) long and took 24 minutes to make. The unifacial tools are represented by 2 end-scrapers, 1 graver and 6 spoke shaves. It took 6 minutes to make these 9 tools. Experimental archaeology has been used by scientists, in one form or another, for approximately two hundred years. The process has been especially useful in the study of stone tools. Projects such as the one illustrated here are valuable for the data they produce and for the innovative thinking they project to others. 1996, Fagan, Brian M., "The Oxford Companion To Archaeology," p. 234. 1998, Thomas, David Hurst, "Archaeology, Third Edition," p. 71. 2008, Missouri Archaeological Society, poster. Personal communications with Tim Baumann. Personal communications with Larry Kinsella.